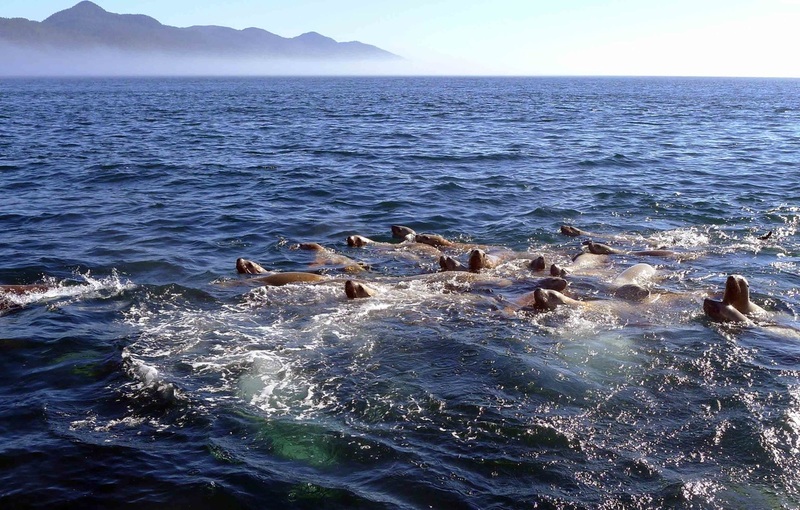 Steller sea lions in nearshore waters of the Central Coast. Photos by Chris Darimont (top), Linda Brown (bottom right), and Natalie Graham (bottom left). The Steller sea lion is the largest of the eared seal, sea lion, and walrus family (Otariidae). It has a distinctive broad, low forehead. Males get up to 3 m long and 1 metric tonne; females get up to 2.5 m long but are slimmer at 270 kg. Males are tan with reddish-brown undersides, while females are tan or brown all over. The Steller sea lion can be found all along the coast of the north Pacific, from the Kurile Islands north of Japan, through the Bering Sea and the Gulf of Alaska, and south to the coast of California. In BC individuals gather at rookeries to breed in June and July; throughout the year they also gather at haul-out sites. When not on land, Steller sea lions spend time travelling and foraging in nearshore waters. The other large, eared seal species that could be mistaken for the Steller sea lion is the California sea lion. 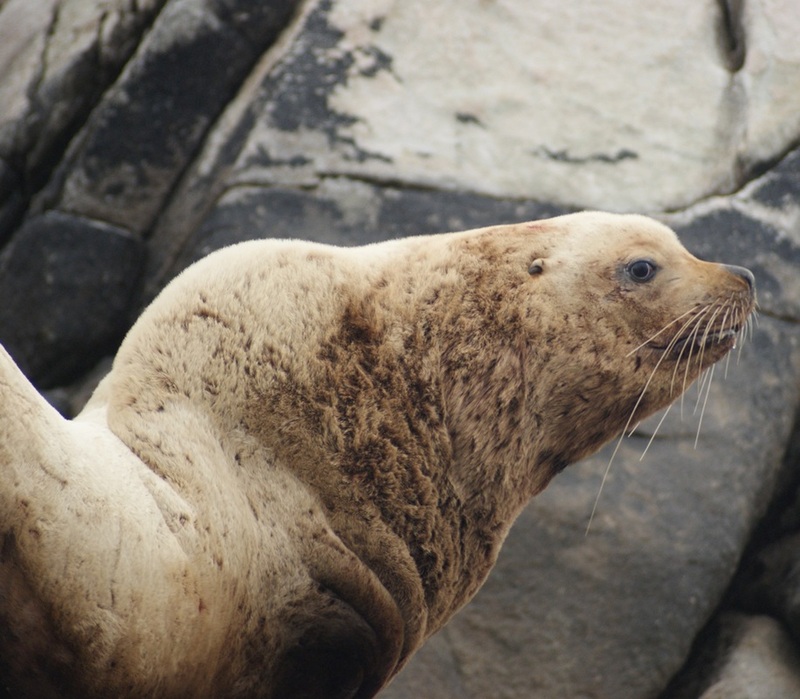 It is smaller and has darker fur than the Steller sea lion, the male lacks a red underside, and instead of a low forehead the male has a bump and light fur on its forehead. Steller sea lions were commercially harvested before they became protected in 1970. Steller sea lions are blue-listed by the province, meaning they are of special concern: due to particular characteristics of the species they are more at risk to become endangered. They are also listed as of special concern by COSEWIC. This listing is because there are only four breeding sites in BC, and population numbers are increasing but still fairly low. This makes them particularly vulnerable to anthropogenic threats such as oil spills, prey reduction by commercial fisheries, and environmental contaminants. 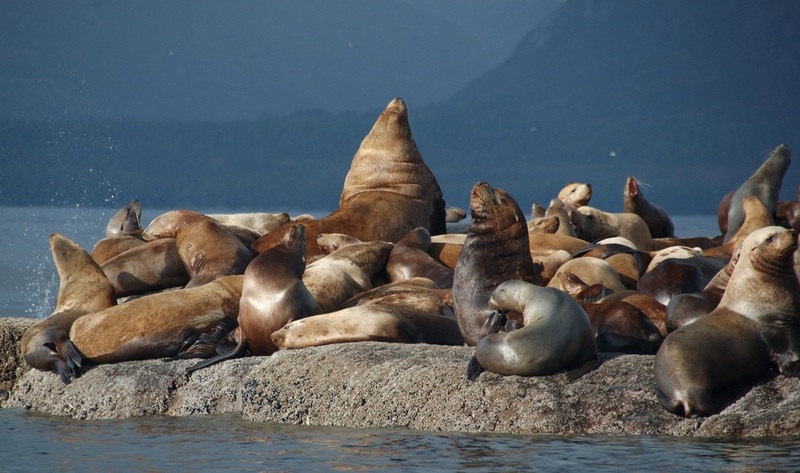 To read more about this listing and the issues Steller sea lions face, check out the Species At Risk Act Managment Plan. Steller sea lions can dive for up to 16 minutes, though they usually make shorter, shallow dives. Instead of the typical seal bark, they make growling and roaring sounds. Harbo, R. M. (1999). Whelks to whales: Coastal marine life of the Pacific Northweest. Madeira Park, BC: Harbour Publishing. P. 179. Olesiuk, P. and Bigg, M. Eumetopias jubatus (Schreber, 1776). In Klinkenberg, Brian. (Ed.). E-Fauna BC: Electronic Atlas of the Fauna of British Columbia. Lab for Advanced Spatial Analysis, Department of Geography, University of British Columbia, Vancouver. Accessed 02/07/2013.